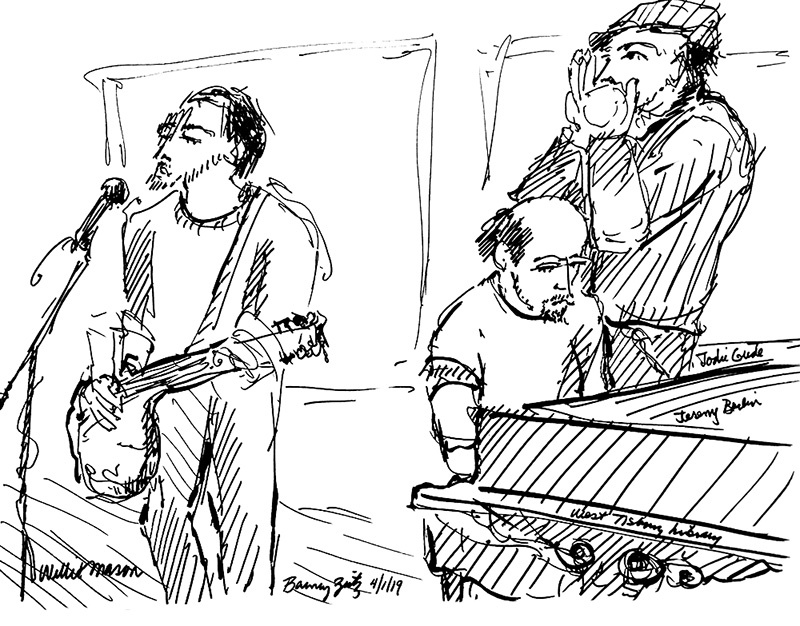 Willy Mason with Geordie Gude on the harmonica and Jeremy Berlin on the piano at the West Tisbury Library. Close to 100 Islanders of all ages, including entire families with children in pajamas, turned out for Willy Mason’s concert at the West Tisbury Public Library Monday night. Singing and playing his Gretsch Electromatic guitar and keeping time with his right foot as he stood behind the microphone, Mr. Mason regaled the audience with 15 original songs, including new material he’s developing for an upcoming album. “Guys, mind if I try a new, kind of rusty one?” he asked, about halfway through the evening. “Living with suspicion makes a mind uptight/Starts to get confused between wrong and right,” he sang, to urgently descending chords from his guitar. Pausing from time to time to sip water from a Bubbie’s pickle jar before carefully replacing the lid, Mr. Mason welcomed harmonica player Geordie Gude to join him. Mr. Gude’s pensive free-reed accompaniment added depth and emotion to several songs including Restless Fugitive. With Mr. Mason’s spare, yet resonant guitar work, this tune recalled the country-influenced jazz of Bill Frisell and Charlie Haden. Pianist Jeremy Berlin rose to the call, joining Mr. Mason and Mr. Gude to wind up the evening with I’ve Got Gold and the rollicking Help That River Flow.